The boost should improve the collider's chances of discovering "new physics" and definitively confirming or denying the existence of Higgs boson particle. The proton beams' energies will be increased by 14%, for a total collision energy of 8 trillion electron volts. The announced increase will break the LHC's own high-energy record. The decision to turn up the energy when the collider switches on again later this year was taken at a conference about the LHC in Chamonix in France. "When we started operating the LHC for physics in 2010, we chose the lowest safe beam energy consistent with the physics we wanted to do," said Steve Myers, director for accelerators and technology at Cern, the laboratory that operates the LHC. "Two good years of operational experience with beam and many additional measurements made during 2011 give us the confidence to safely move up a notch, and thereby extend the physics reach of the experiments before we go into the LHC's first long shutdown." That should result in an operating proton beam energy of 14 trillion electronvolts, or teraelectronvolts - double the energy used to date. 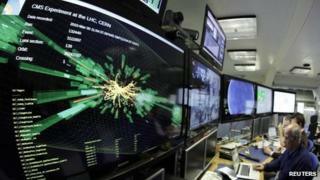 The LHC collaboration hopes to reach that milestone in 2014, re-starting the hunt for "new physics" in early 2015. In the 2012 run of experiments, the team hopes among other things to definitively confirm or rule out the existence of the Higgs boson, the particle hypothesised to be the origin of mass in the Universe. In announcements made in December 2011, teams from the two major detectors at the facility announced they had seen hints of the particle but stopped short of claiming they had seen it with certainty. Last week, the teams formally submitted their papers to academic journals for review by the scientific community. While the data from the Atlas collaboration largely repeated what had been reported in December, the CMS collaboration's analysis included new data in support of a Higgs boson with a mass about 132 times that of the proton, slightly lower than that reported by Atlas. Researchers are still investigating the discrepancy, which may affect the degree of certainty that the Higgs has in fact been glimpsed. What is certain is that more data to be taken in 2012 will settle the debate. While the collider's proton beam energies will be boosted by 14%, improvements in data handling and the ability to focus those proton beams mean that the machine's "luminosity" - a measure of how intense and productive the collisions ultimately are - should lead to a three-fold increase in data it produces compared to 2011.